DITTY- Ditty bag: a small bag used to carry items while traveling. Jennie and Scott started giving some serious thought to food transportation when their young daughter Ande was found to be allergic to PVC plastic. Their solution was organic cotton! 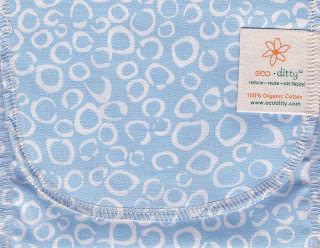 They continue to only use 100% organic cotton, inside and out. That is what sets them apart. By doing this we are able to keep a plastic sack out of the landfill and BPA and PVC toxins out of our bodies. Perfect for trail mix, apple slices, carrot sticks and more healthy snacks on the go. Perfect for packed lunches and trips to the park. Available in several designs and sizes. Mix and match or color coordinate your lunch bags! I received a product from ecoditty in exchange for an honest review.